Ikechukwu Uche says he harbours no bad feelings towards coach Stephen Keshi, despite being omitted from Nigeria's provisional 30-man World Cup squad. The Villarreal striker was not picked by Keshi, despite scoring 12 goals in the Spanish top flight this season. 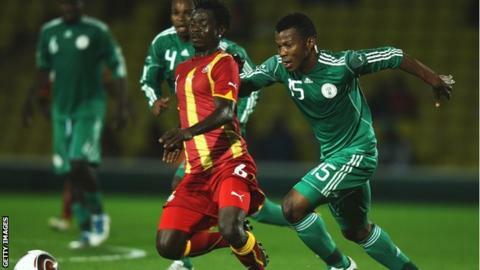 Uche has not played for his country since they won the Africa Cup of Nations in South Africa last year. The 30-year-old insists, however, that he holds no grudges against Keshi. "Of course as a professional footballer you'd love to represent your country, but I have never had bad words towards the national coach," he told BBC Sport. "We spoke two weeks before the squad was announced to clarify certain things that had been written and said in the media. "Most significantly, it was a very good discussion. It gives me great pleasure that there is no ill will towards anyone. "I thank the coach for that. I also wish my teammates all the best in Brazil because we are all one family whether you are in the squad or not." Keshi has been criticised for leaving Uche out of the squad, but the player insists that attention should shift towards the Super Eagles team and not individuals. "I thank the fans and those passionately concerned about my omission. I'm grateful for their support and best wishes. "For me, those picked and those left out are also aware that the country's success is more important than personal glory. "I'll be supporting my country. And I wish the team all the best at the World Cup." Uche is widely regarded as one of Nigeria's most reliable strikers at international level and is one of his nation's all-time top scorers, with 18 goals in 45 appearances, behind Rashidi Yekini, Segun Odegbami and Yakubu Aiyegbeni. His last appearance for the Super Eagles was in the final of the 2013 Nations Cup, against Burkina Faso. Despite emerging as top scorer during the tournament's qualifiers with three goals, he failed to shine in South Africa and has since been overlooked.